Professional Hearing Services provides repairs for a wide range of makes, models and styles of hearing aids. A thorough cleaning of your hearing aids to remove wax and debris from the microphone and receiver ports can be done in a matter of minutes with our specialized equipment. Many minor hearing aid problems can also be taken care of in office while you wait. A computerized analyzer can check the function and performance of the hearing aid’s circuitry to determine if it needs manufacturer repair. 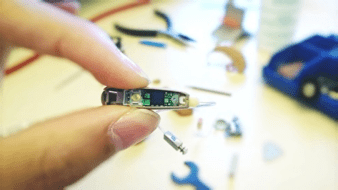 Typically, hearing aids up to 10 years of age can be repaired by the manufacturer and provided either a 6 to 12 month warranty – repair cost estimates can also be provided. Easy – one annual fee covers all hearing aid repairs, your annual comprehensive hearing and hearing aid checkup, plus any necessary hearing aid adjustments and cleanings for the one year service period. Select Care Extended Warranty will not only save you money on repair costs, it will also save you money on cleanings, checkups and adjustments (estimated value of up to $560). All hearing aid styles and levels of technology can be warrantied for one year at a cost of $125.00 per hearing aid. Loss or damage caused by negligence or misuse. Recasing or reshelling of the instrument(s). Contact Us Today for Your Device Repair!